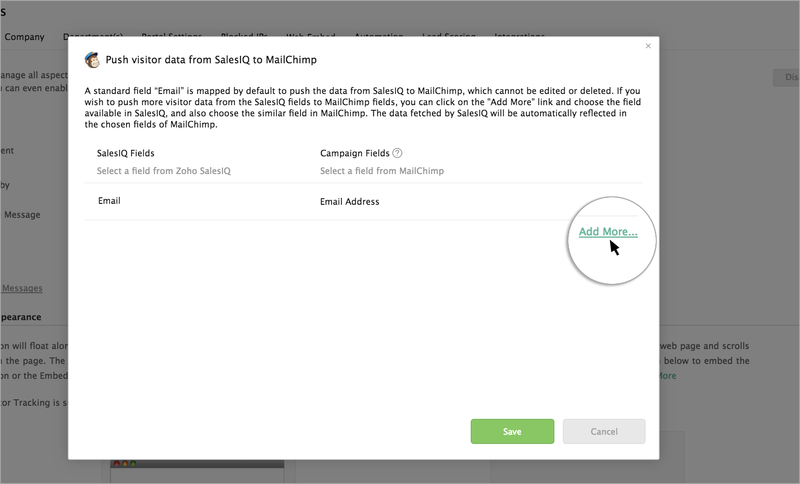 Integrating your MailChimp account with SalesIQ will help you to identify the visitor visiting your website through the marketing emails and targeted campaigns. You can also grow your newsletter subscribers list by allowing them to sign up for your newsletters when filling out the pre-chat survey. 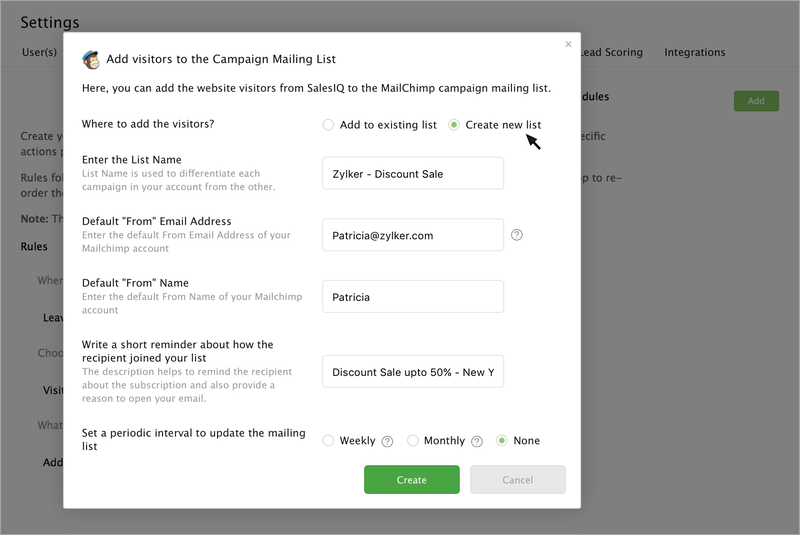 The Marketing campaigns sent via MailChimp Campaigns can be tracked, and all the activities of the visitor will be reported in your SalesIQ dashboard. 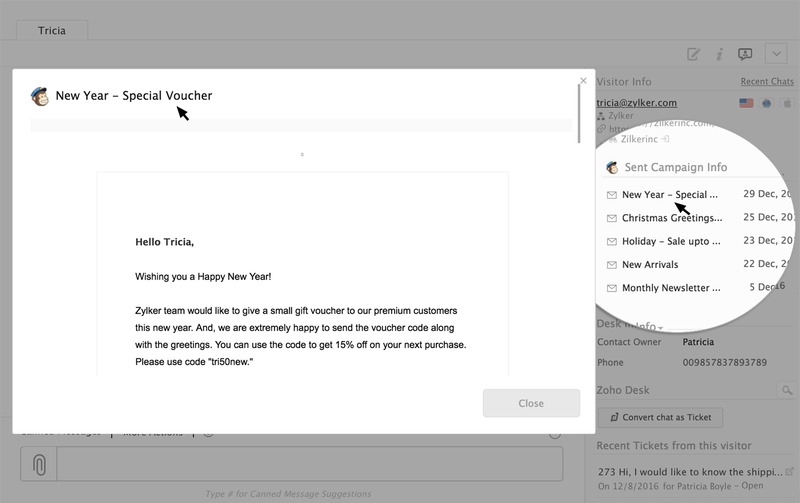 Also, your users can gain knowledge about the email campaigns sent to the particular visitor when they visit your website which makes the sales/support process, even more, easier. 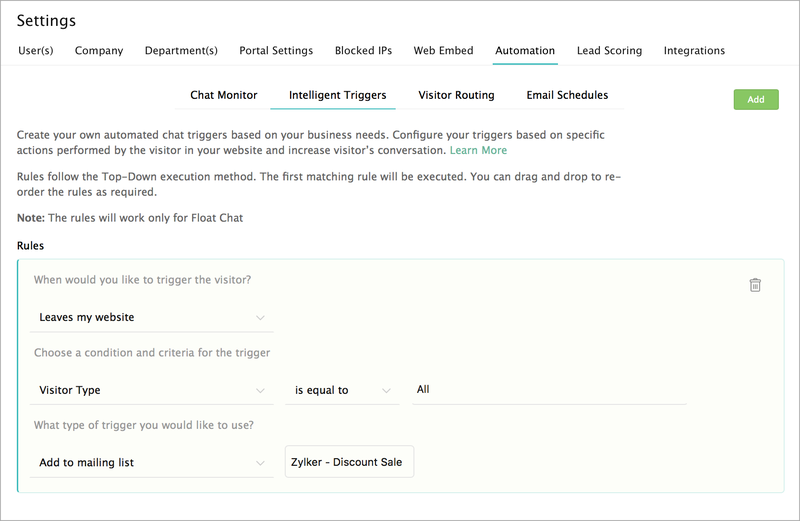 You can add chat signatures to your email campaign and get live chat into your SalesIQ dashboard. To use Zoho SalesIQ integrated with MailChimp, you will need to be a customer of the Enterprise/Professional/Basic plans of Zoho SalesIQ and have a MailChimp account. You can also try this feature during your 14 days free trial. 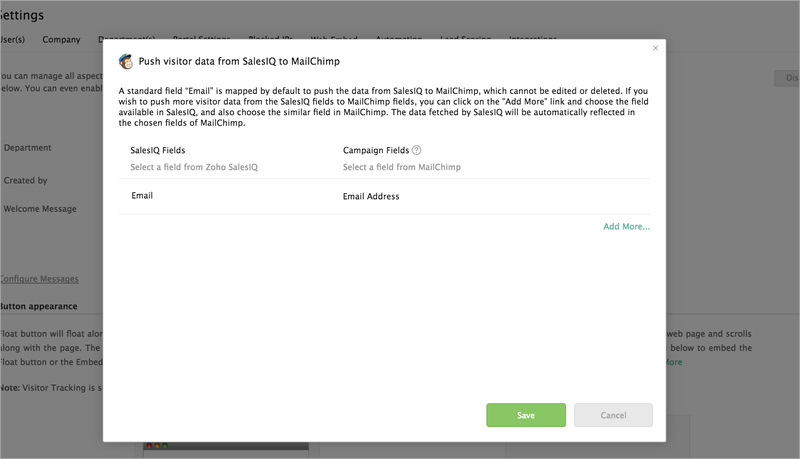 How to integrate MailChimp Campaigns with your SalesIQ? 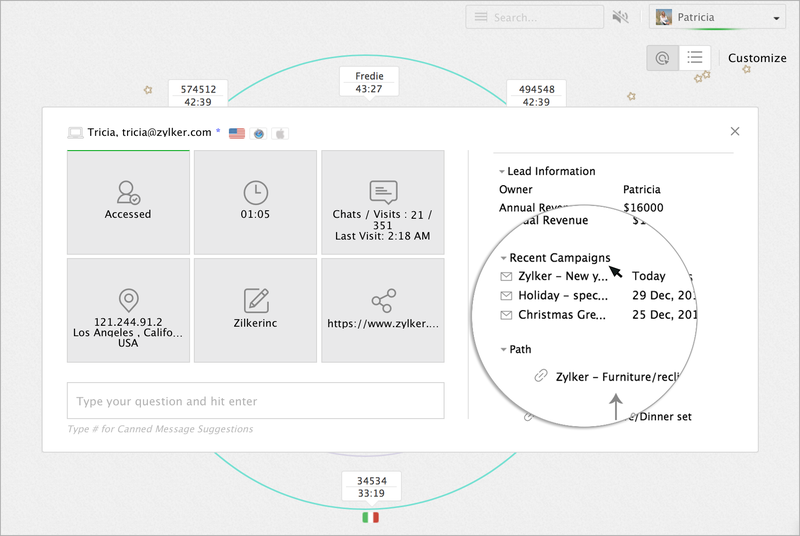 Who can view the MailChimp Campaigns info in SalesIQ dashboard? Where do the Sent Campaign details displayed in SalesIQ dashboard? How to score the website visitors based on the email campaigns sent via MailChimp Campaigns? How to prioritize the website visitors in the tracking rings based on the email campaigns sent via MailChimp Campaigns? How to filter the website visitors in the visitor history based on the email campaigns sent via MailChimp Campaigns? How to identify website visitor's name and email id referred from MailChimp campaign? 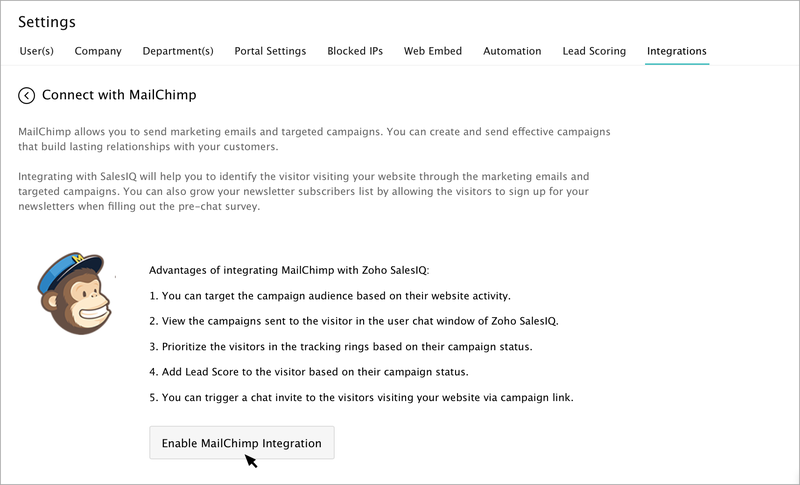 To integrate MailChimp campaigns with SalesIQ, go to SalesIQ -> Settings -> Integrations. 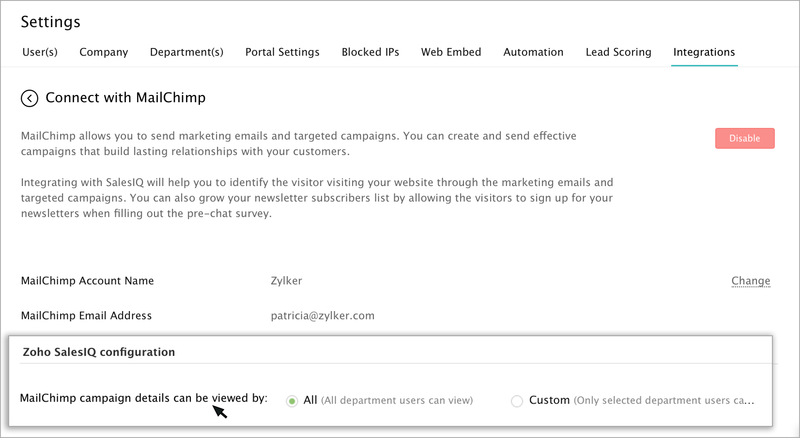 Navigate to MailChimp, and click on the Enable integration button in the welcome page. 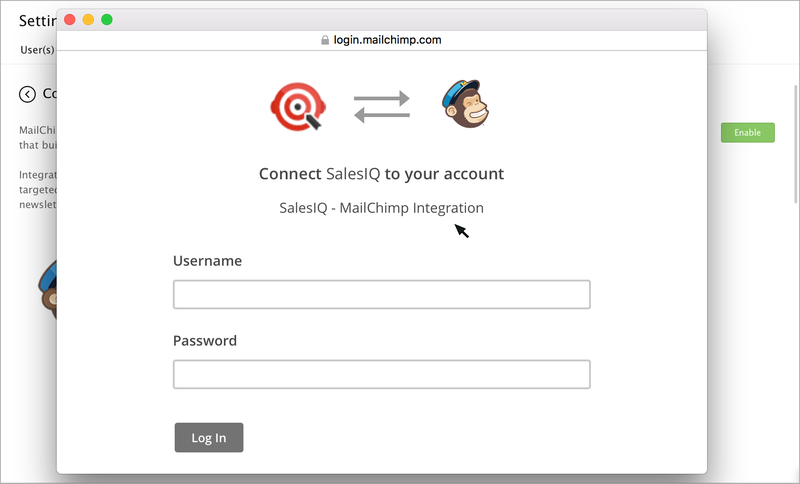 The MailChimp - SalesIQ integration page appears in a new window. 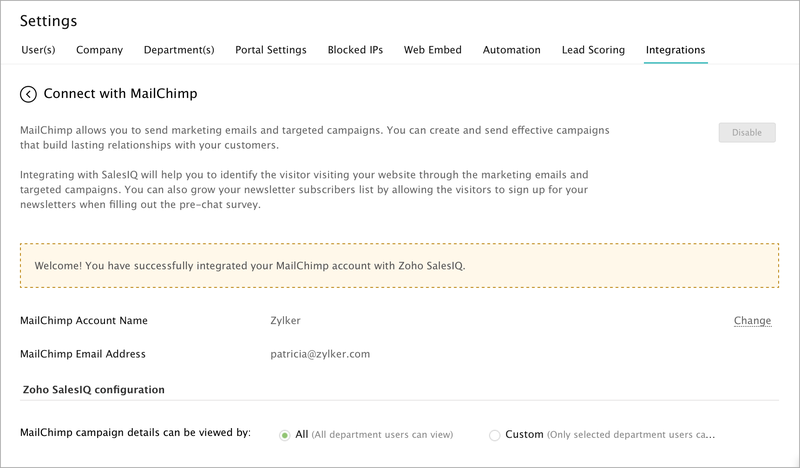 Enter your MailChimp Username and password, and click Log In. 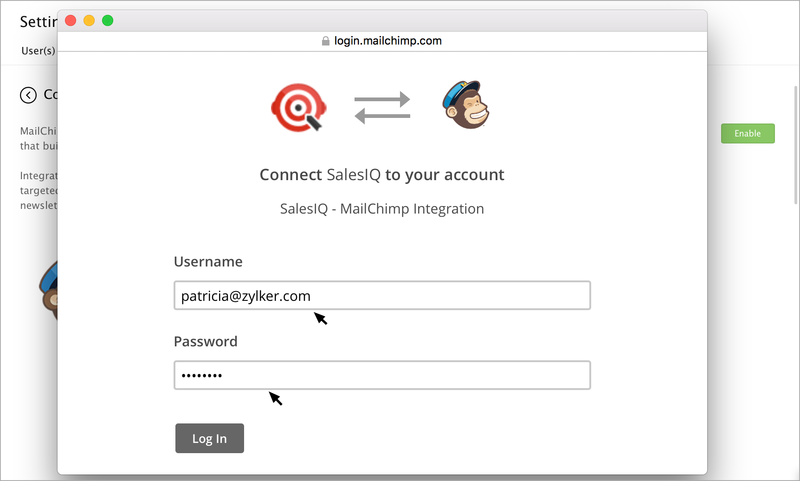 Your MailChimp account is now integrated with SalesIQ. 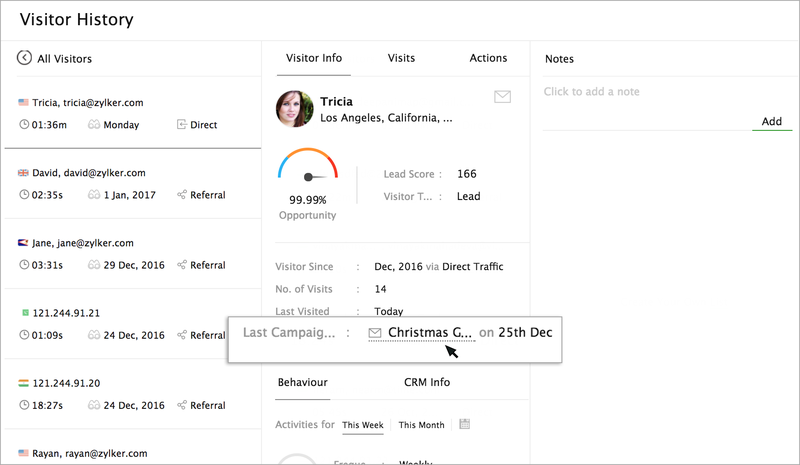 Who can view the MailChimp Campaign details in the SalesIQ dashboard? 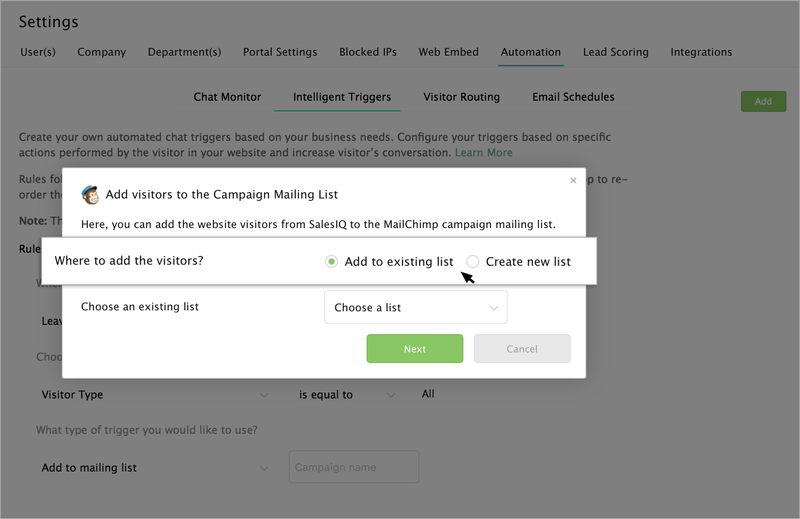 If you wish to show the campaign details to all the Users irrespective of departments, then you can choose "All" option in MailChimp Campaign details can be viewed by section. You also have the option to select the departments who can view the Campaign details in the Zoho SalesIQ dashboard. 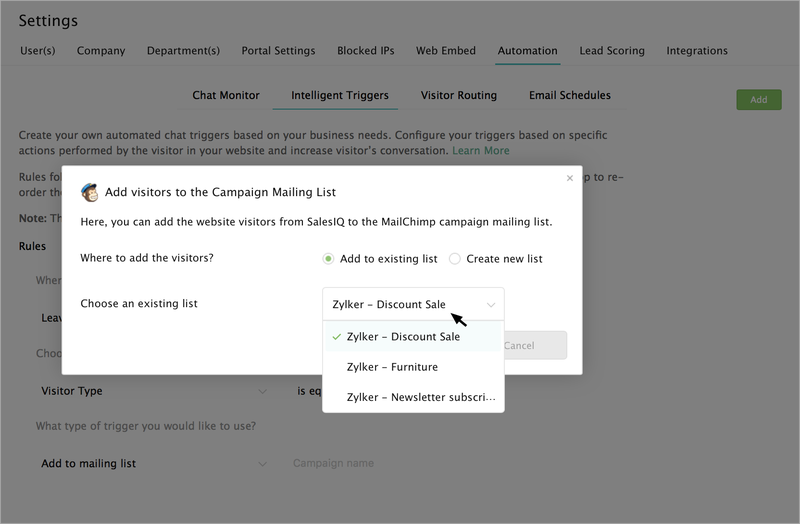 To allow only selected departments to view the campaign details, choose the "Custom" option in the MailChimp Campaign details can be viewed by section. A search option will appear, click on the search bar. The departments available will auto-populate in the drop-down, Choose the departments. 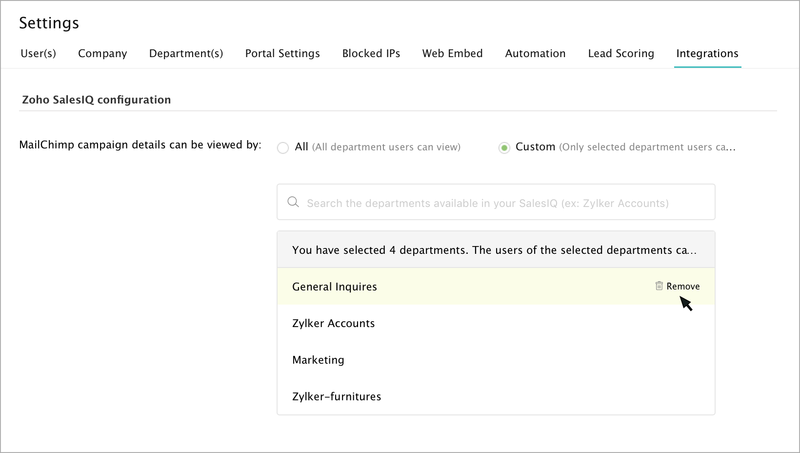 Now, the users of the chosen department can only view the MailChimp Campaign Details in Zoho SalesIQ dashboard. You can delete the chosen departments by clicking on the "Remove" button. 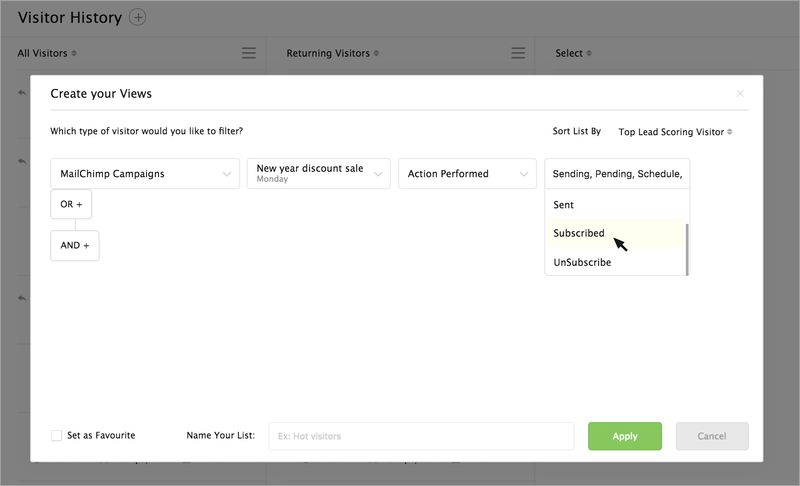 SalesIQ now allows you to configure the "Newsletter Subscription" option in the pre-chat survey window, which allows your visitors to subscribe to your newsletters sent from MailChimp Campaigns. 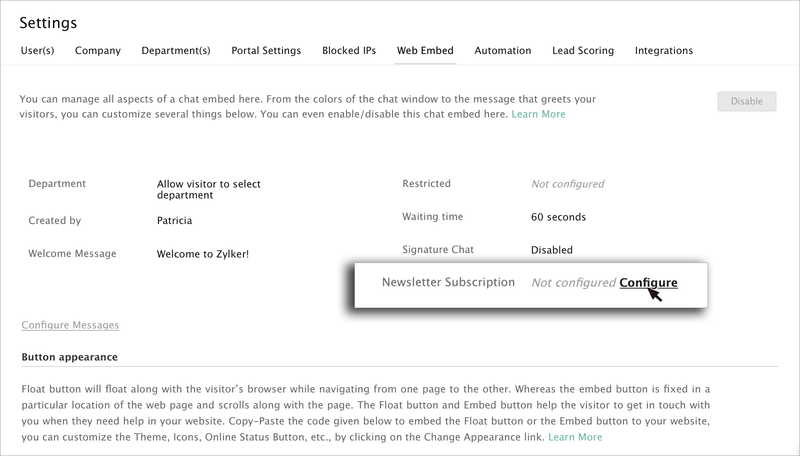 In Settings ->Web Embed, you can click on the "Configure" link near the Newsletter Subscription option. 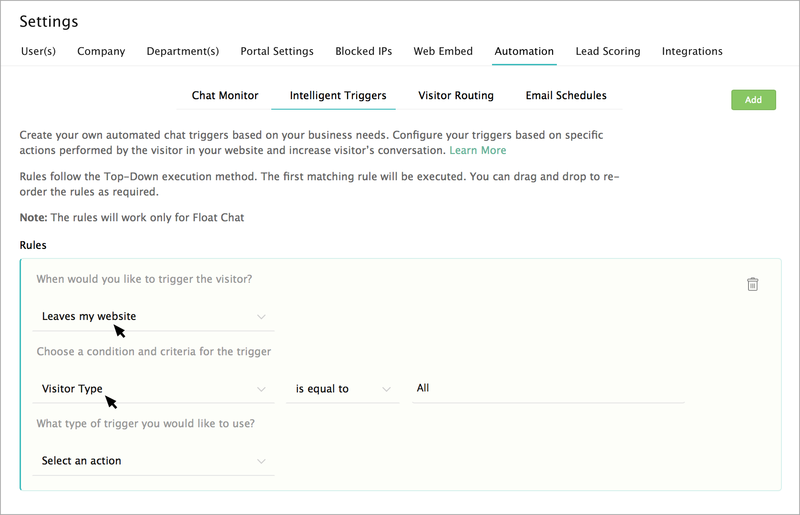 A dialog box will appear, enter the text you would like to display to your website visitors in the chat window. Then, choose a mailing list from the drop down and click Next. 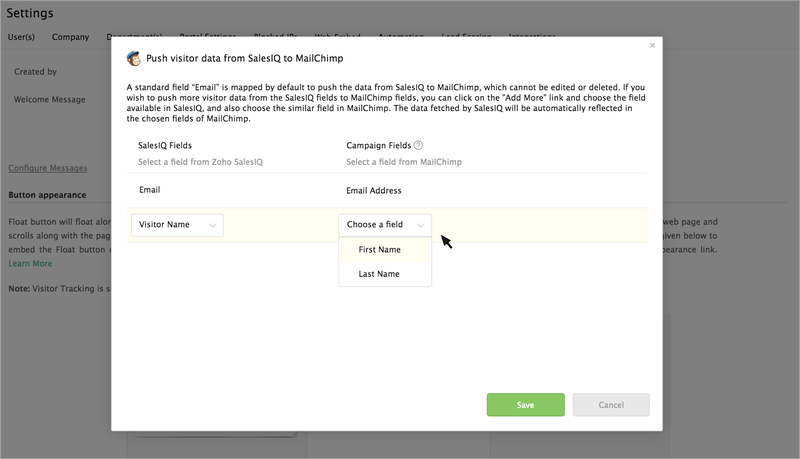 You can choose the fields to push the data automatically from SalesIQ to MailChimp Campaigns. By default, the Email field in SalesIQ and Email Address field in MailChimp Campaigns were mapped. Other than the email field, you can choose four more fields to be mapped. Click on "Add More" to map other fields. Choose the field you would like to map in SalesIQ from the drop-down under "SalesIQ Fields." Then, choose the parallel field in MailChimp Campaigns from the drop-down under "Campaign Fields." 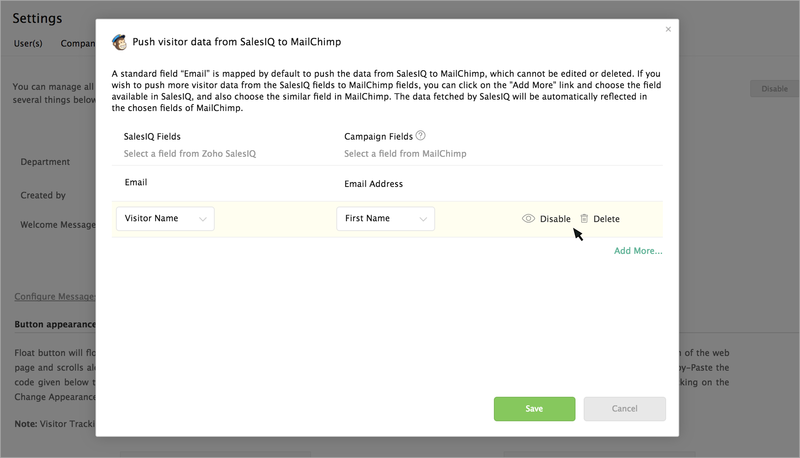 The data fetched by SalesIQ will be pushed to the selected fields in MailChimp Campaigns. You can also disable or remove the added fields using the "Disable" and "Delete" buttons. 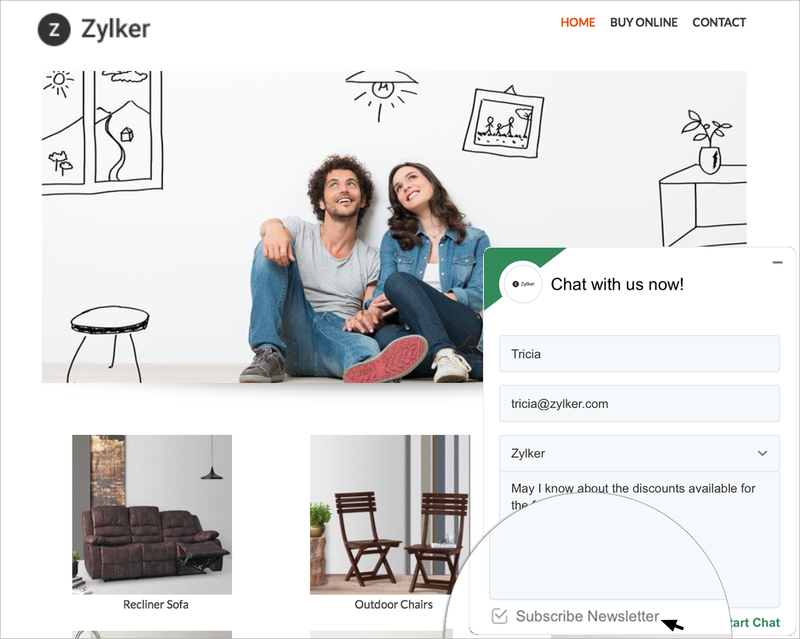 Now, the visitors who access the chat widget on your website will be able to view the Newsletter subscription option in the pre-chat survey window. You can view the status (Paused, Pending, Save, Schedule, Sending, Sent, Subscribed, Unsubscribed) of the last three campaigns sent to the visitor in the proactive chat window. You can view the list of last five campaigns sent to the visitor in the ongoing chat window/chat history under the Sent Campaign info section. You can click on the Campaign name to view the entire campaign content. You can view the Last campaign sent to the visitor in the visitor history section. You can click on the Campaign name to see the campaign content. 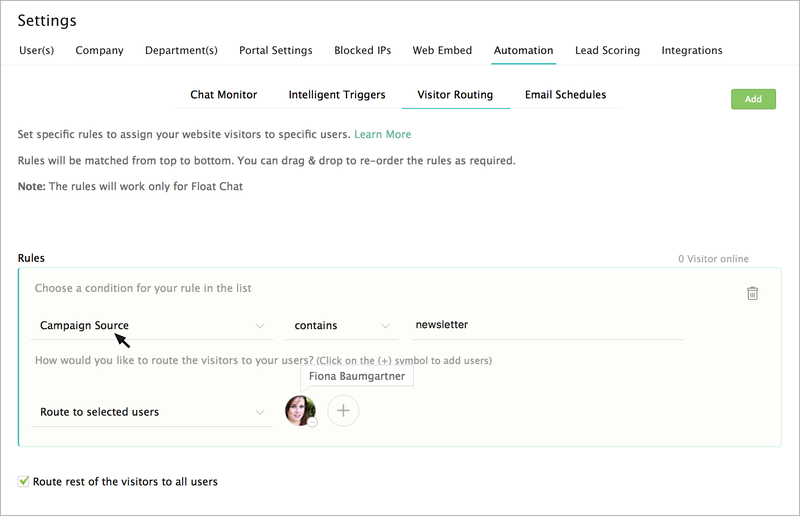 You can now score the visitors visiting your website from the specific email campaigns sent via MailChimp Campaigns. 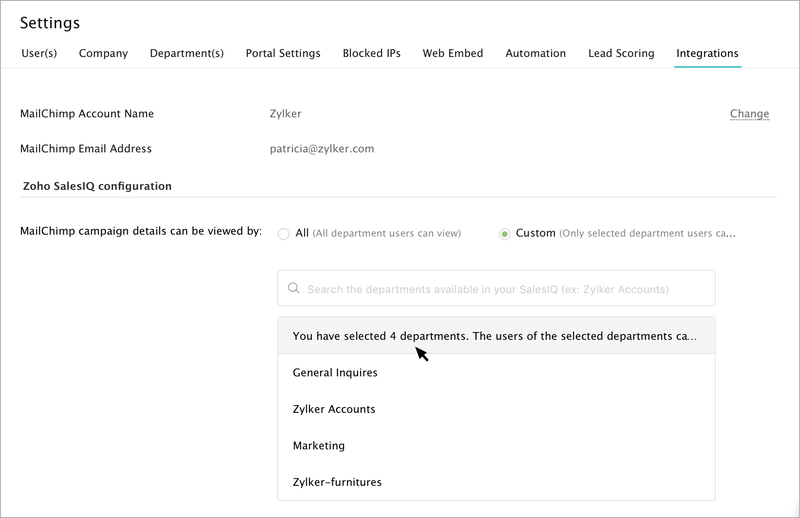 Go to Settings -> Lead Scoring -> Add in Zoho SalesIQ. Select MailChimp campaigns in the condition drop-down. 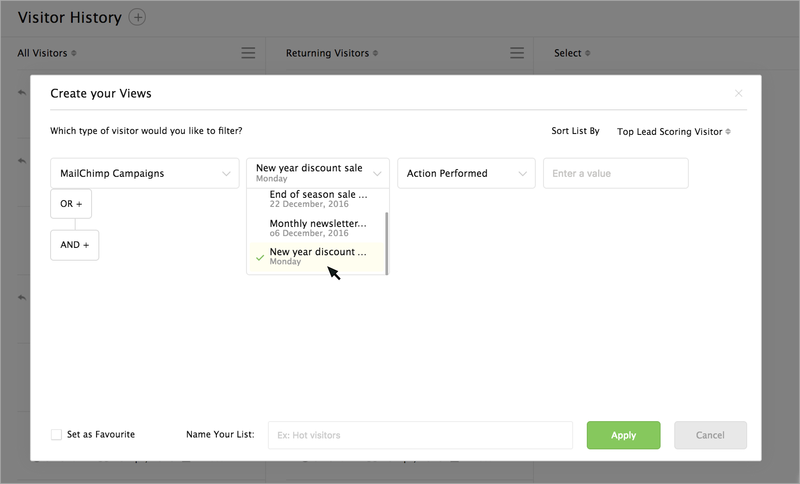 The emails campaigns sent from your MailChimp Campaigns will be listed in the next drop-down. Choose an email campaign. Then choose an action based on which you would like to score the visitor. Now select the points you would like to award for the specific action. 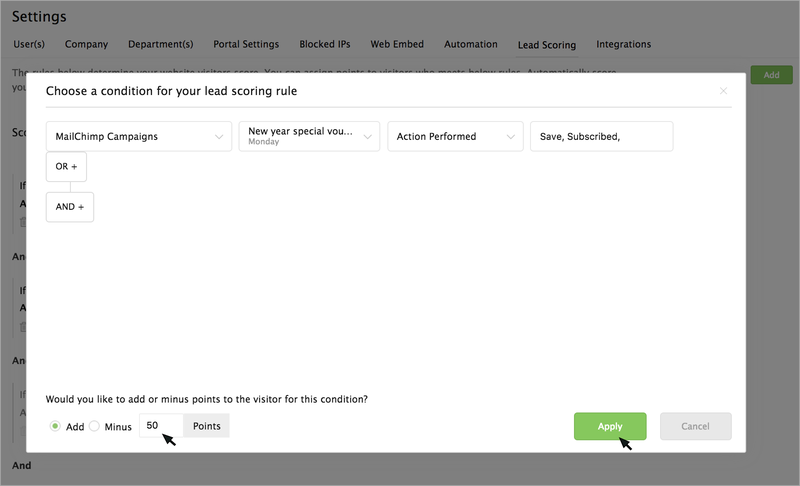 Now when each time, the visitor visit your website from the specified email campaign, then the points you have chosen will be added/reduced to the visitor's score. 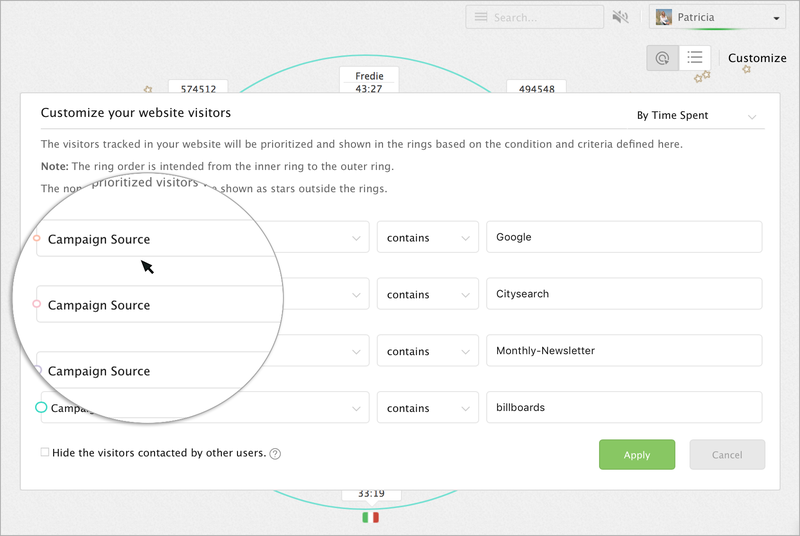 You can prioritize the website visitors on your tracking rings based on their email campaign. 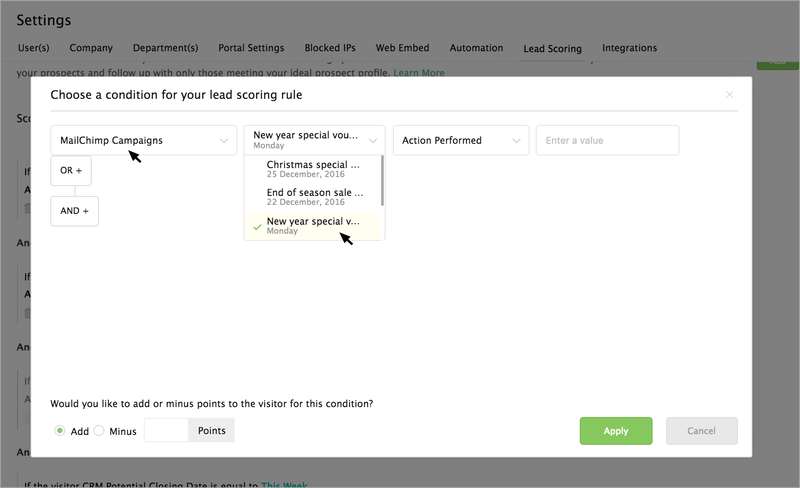 In tracking rings -> customization, select MailChimp Campaigns in the condition drop-down. 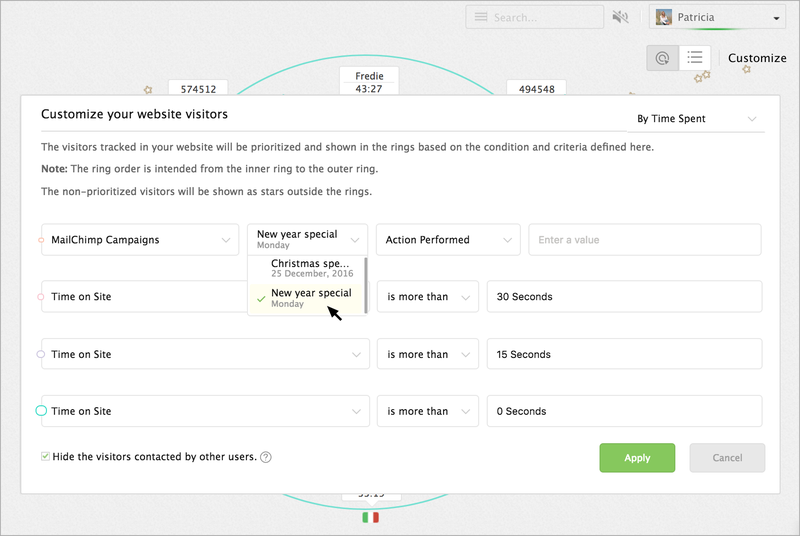 Then choose an action based on which you would like to prioritize the visitor in the tracking rings. 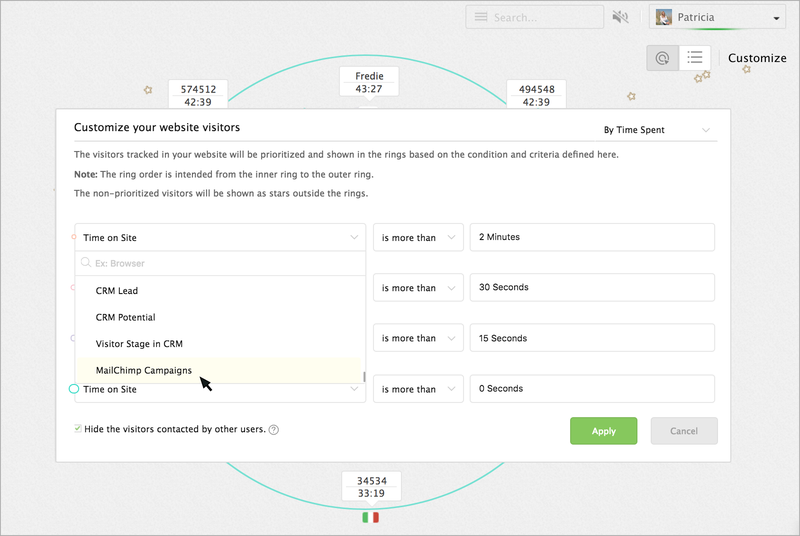 Now, the visitor visiting your website from the email campaign will be prioritized in the specified tracking ring. How to filter the website visitors in visitor history based on the email campaigns sent via MailChimp Campaigns? 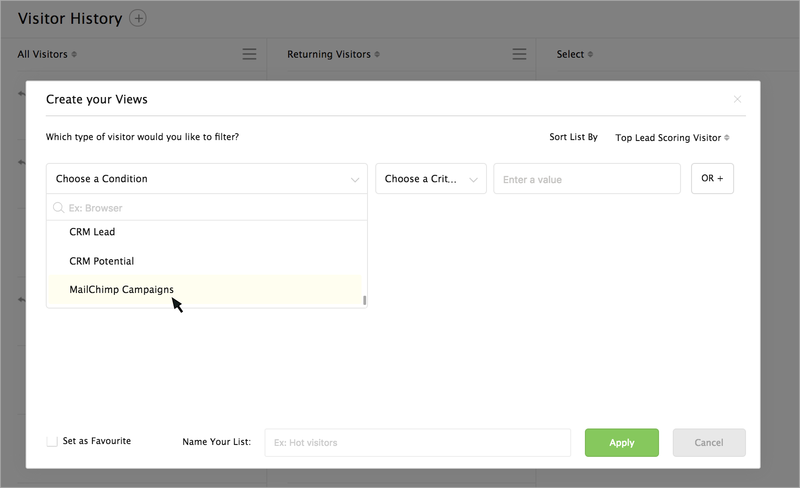 You can apply a filter to list the visitor visited your website from a specific email campaign. Go to Visitor History -> Add symbol (+) -> Create your views. Now select "MailChimp Campaigns" in the conditions drop down. Then, select an action based on which you would like to get the visitor list. Then, provide a name for your list and click on the Apply button. The visitors visiting the website via the specified email campaign will be listed in a separate column. 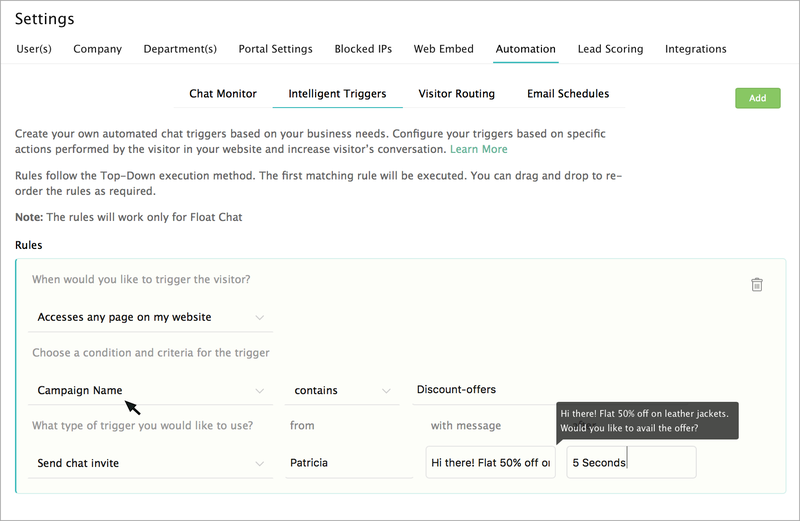 You can set a special trigger to the visitors visiting your website from the email campaigns you have sent. In settings ->Automation ->Intelligent triggers ->Add. Choose when would you like to execute this trigger to the visitor in "When the visitor" section. 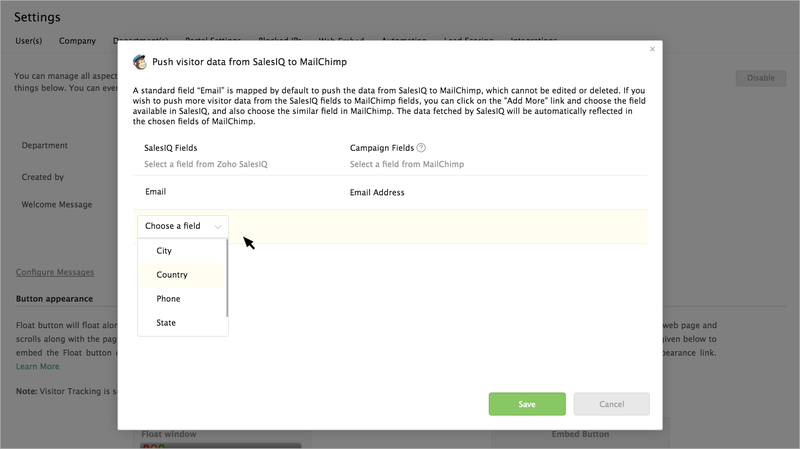 Now select "MailChimp Campaigns" condition in "And if" section. 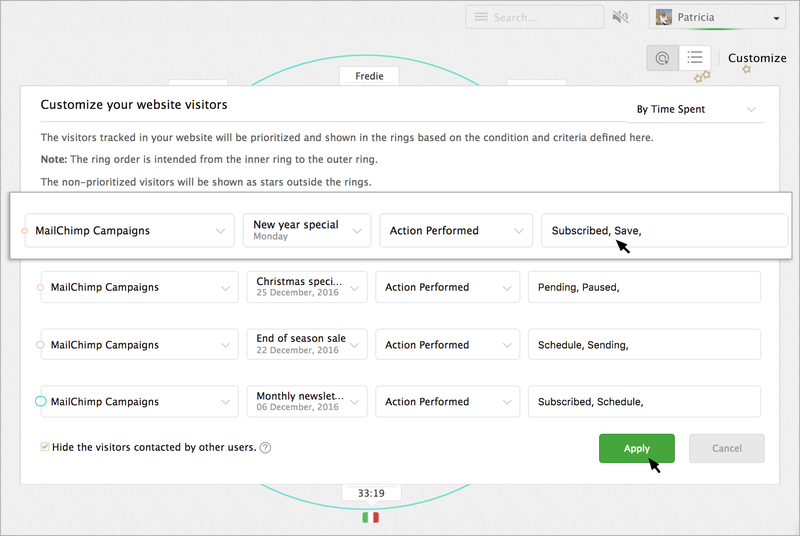 Then choose an action based on which you would like to trigger the website visitor. Select the type of trigger action you would like to perform to the website visitor in the drop-down. 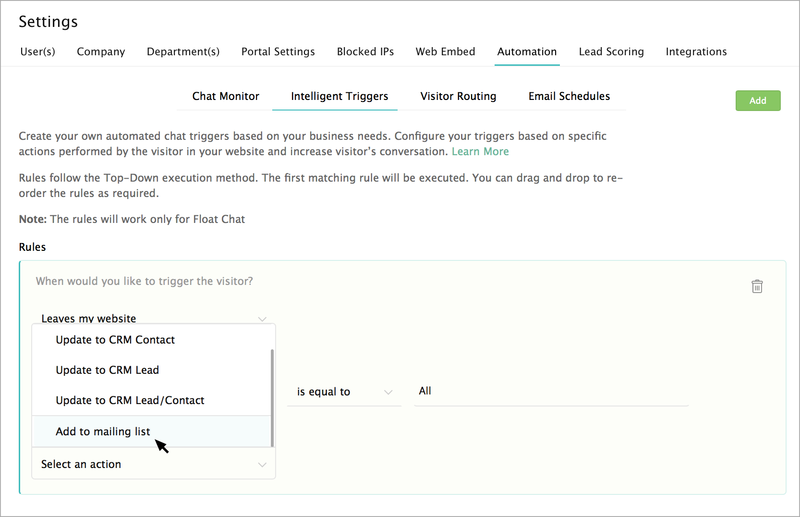 Now when the visitor visits your website from the specified email campaign, then the action you have set (open chat window) will be triggered. In Settings -> Automation -> Intelligent Triggers ->When the Visitor drop-down, select the "Leaves the Website" option. Then, set a condition and criteria. Choose the “Add to mailing list” option in the select an action drop-down. Choose the "Create a new list" option to generate a new list, and then enter a name for the new mailing list in the "Enter the list name" text box. 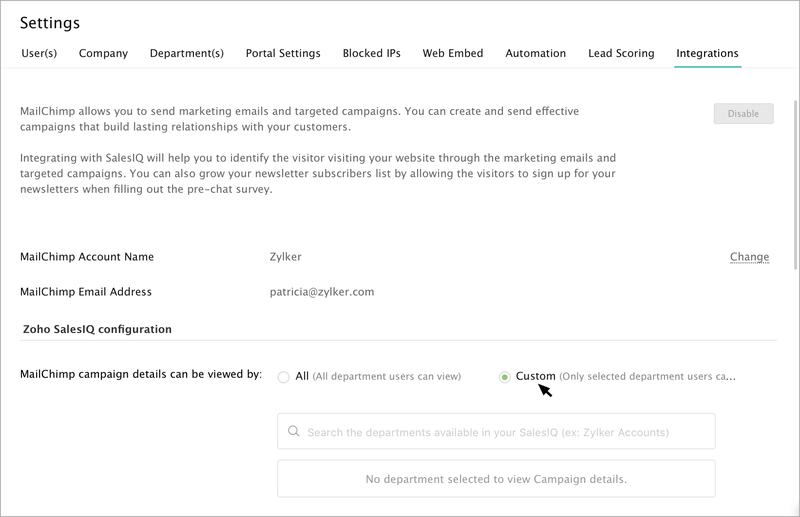 In the "Default From Email Address" and "Default Name," enter the default email address and Name of your MailChimp Campaigns account. Then, provide a description you would like to remember about the recipient who joins this list. If you wish to accumulate and update the visitors at a periodic interval, choose between weekly and monthly. By default, "None" option is selected. How to identify the website visitors name and email address referred from campaign emails sent through MailChimp? You can identify the website visitors from the Mail Chimp campaign by adding the below-mentioned SalesIQ parameter after the backlinks (which directs the customer to your website) in the campaign emails. In the visitor tracking operator console, click on the "customize." The "Prioritize your visitors" pop-up will then appear for prioritizing the visitors based on the campaign UTM values. 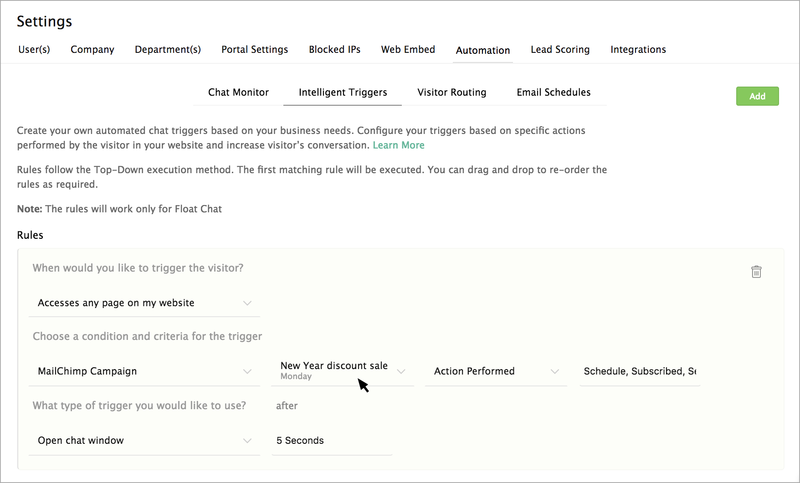 In the Settings, select the “Automation” tab, and click on the "Intelligent Triggers" to set your required Campaign UTM filters. 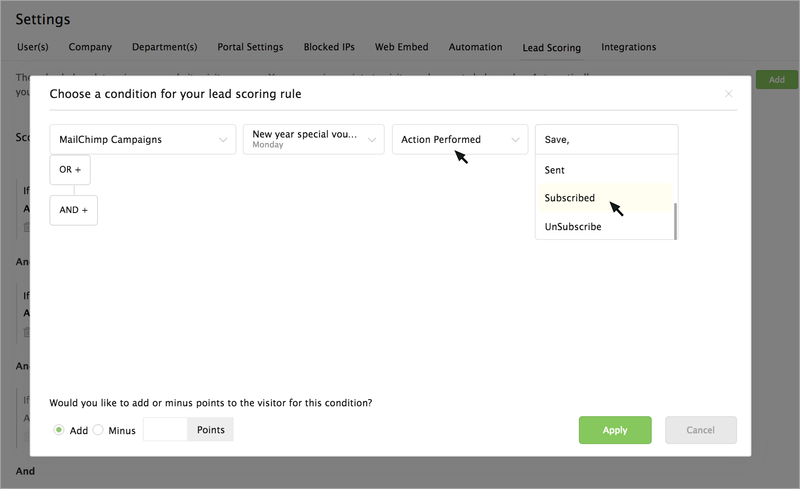 In the Settings, select the “Automation” tab, and click on the "Visitor Routing" to set your required Campaign UTM filters. To add the agent's name in the “route to agents” section, click on the "+" symbol and enter the agent name in the textbox. Yes, it is possible. 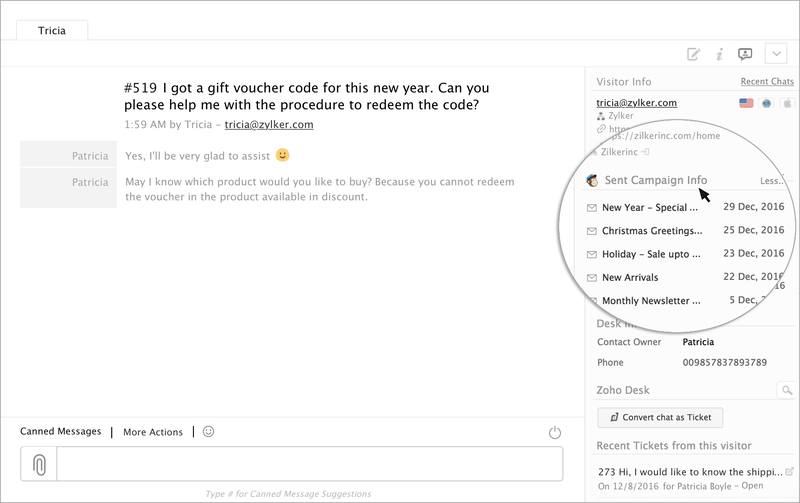 Zoho SalesIQ is well equipped that you can add a chat button in your campaign emails and get chats directed into your SalesIQ. To know more about Signature Chat, click here.